The King Cobra is the longest venomous snake in the world. It is famous for its fierceness and is extremely dangerous. The scientific name for the king cobra is Ophiophagus Hannah. The King Cobra lives in Southeast Asia including parts of India and other countries such as Burma, Thailand, Indonesia, and the Philippines. They like to live in forests and near water. They can swim well and can move quickly in trees and on land. How big does the King Cobra get? King cobras typically grow to around 13 feet long, but they have been known to grow as long as 18 feet. The color of the king cobra is black, tan, or dark green with yellow bands down the length of the body. The belly is cream colored with black bands. Is it the most venomous snake? 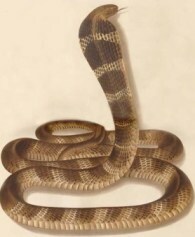 The venom of the king cobra is not the most toxic that is delivered by snakes, but they are still considered one of the most deadly snakes because of the amount of venom they can deliver in a single bite. A single bite from a king cobra can deliver enough venom to kill an elephant or 20 grown men. When a king cobra feels threatened it will raise its head high off the ground to prepare to strike. The sides of its head will flare out to create a menacing hood. They may also let out a fairly loud hiss that almost sounds like a growl. The main food for the king cobra is other snakes. However, it will eat small mammals and lizards too. They are the only snake that builds nests for its eggs. The female will guard the eggs until they hatch. Snake charmers in Asia often charm king cobras. The cobra is mesmerized by the shape and movement of the flute, not by the sound. They live to around 20 years old. Its conservation status is "least concern". The main predator to the king cobra is the mongoose because the mongoose is immune to its poison. 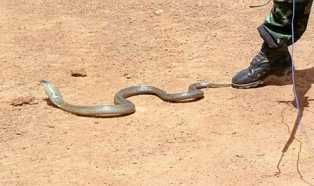 However, mongooses rarely attack king cobras unless they have to. Venom from a king cobra can kill a human in around 45 minutes. However, they do not attack unless they feel cornered and only around 5 people a year die from king cobra bites. They shed 4 to 6 times per year. They are revered in India where they represent the god Shiva.